We've had a relatively easy day so far. We rose late, after 08:00, ate breakfast of Weet Bix, then packed and checked out of the Cooinda Lodge. I bought some cheese and bacon bread rolls for an early lunch on the road. After cleaning the bug splats off the windscreen of the car, we hit the road to Jabiru. We first stopped at Mirrai Lookout - which I hadn't known about but which was signposted from the road. It turned out to be a 1.6 km walk up a moderately steep hill to an observation platform at the summit. It was hot and hard going. We passed a group of noisy red-tailed black cockatoos on the way. 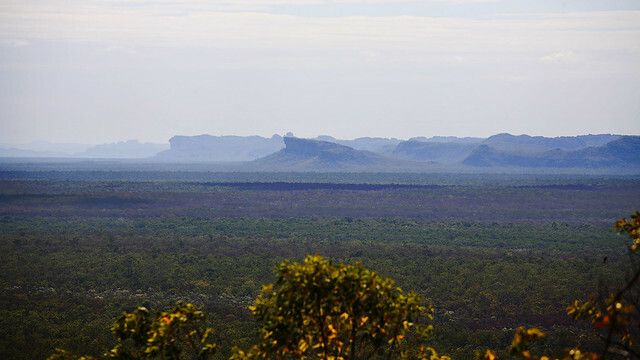 At the top, we were greeted with panoramic views across Kakadu, with the Arnhem Escarpment to the east and the flat floodplains to the west. We lingered in the shade of the viewing platform for a few minutes before braving the walk down. I tried to get a photo of the cockatoos, but they took flight and moved further away each time I was just getting into a decent range. 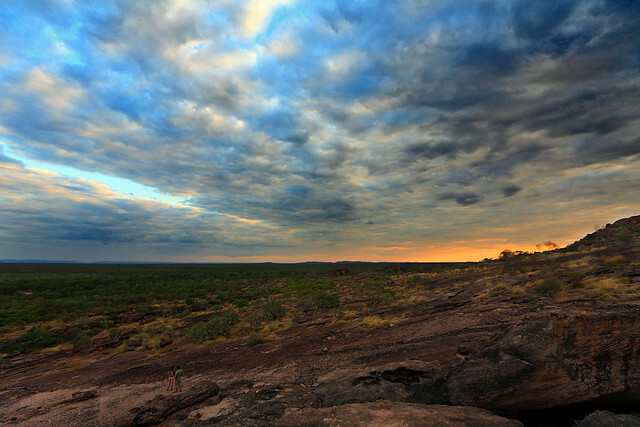 Next stop was Nourlangie Rock, site of some of the best known Aboriginal rock art in Australia. The walks here to view the art were thankfully fairly short, easy, and mostly shaded from the fierce sun by the looming outcrop of Nourlangie itself. The art was amazing - easily the best we've seen on the trip so far. 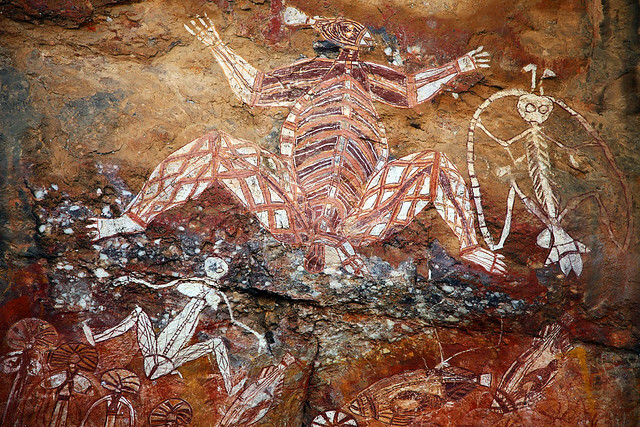 There were plentiful figures of people and of Mimi - Dreamtime spirits who taught the first people the ways of the world - as well as fish and other animals, all done in a distinctive cross-hatched style in red and yellow ochre, charcoal black, and white. Some of the figures were faded to some degree, but a large number were bright and vivid, as if painted yesterday. 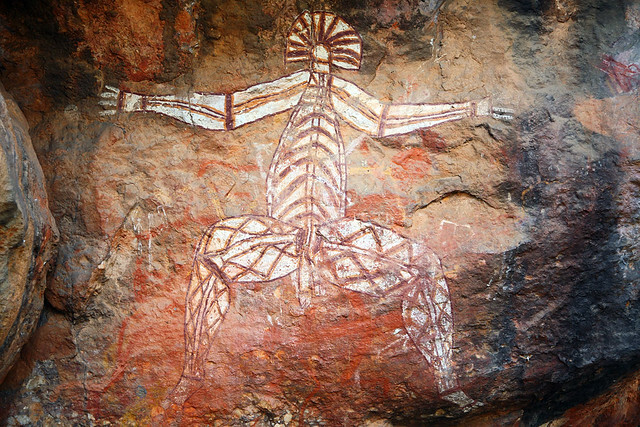 The colour and clarity of the lines was startling, especially after becoming familiar with rock art elsewhere that has been at times difficult even to discern, let alone appreciate the sheer artistry of. The gallery continued along the base of Nourlangie for some way, including a striking portrayal of "Lightning Man" - a being associated with the Lightning Dreaming and responsible for the monsoon storms of the Wet season. 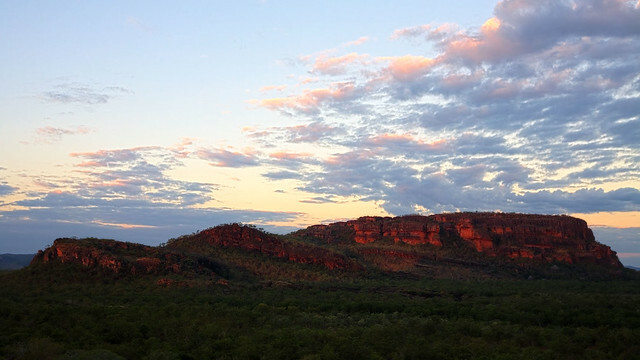 Nourlangie is noted for being an important site on the Lightning Dreaming track across the top end of the country. Following the rock art, there was a track leading a few hundred metres up a slope to Gunwarddehwardde Lookout on top of a crumbly stack of course conglomerate decayed into sharp edges with protruding lumps of quartz. There were posts and chains in place to prevent people from walking too close to the dangerously crumbly cliff edge. The view was impressive though, with Nourlangie Rock looming overhead to the north, with its water-stained layers of sandstone in orange, black, and white stripes. The walk returned in a loop down to the paved path near the art sites. This walk was much less strenuous and also more rewarding and satisfying than the Mirrai Lookout. Back at the car, we retrieved bread rolls and water to sit in the shade of a shelter and eat lunch. Following lunch, it was on to Jabiru. Just before the town, we ran across the Bowali Visitor Centre, the central administrative point for Kakadu. We stopped in to have a look at its displays about the park and its geology, flora, fauna, weather, and indigenous people, but also simply to get into air-conditioned comfort out of the heat and humidity of the day. While decent, the visitor centre was not brilliant, but it did make an interesting diversion and was worth the 15 minutes we spent there. Jabiru was a short walk from the visitor centre, but another 6 km by road as it looped around to the north to first join the Arnhem Highway and then back south again into the town. We arrived at the Crocodile Inn, driving right through the mouth of this crocodile-shaped hotel to check in at the reception desk. We secured a room up on the first floor, overlooking the pool, right by the crocodile's right foreleg. The legs are stairwells. After a few minutes rest we walked across the road to check out the shopping centre. I'd assumed it would be bigger than Yulara, but it turned out to be roughly the same sort of size. M. searched for somewhere to buy a book, having finished the novel she'd brought with her, but the pickings were extremely slim. We bought some fresh fruit, bread rolls, and cheese for lunch tomorrow and milk for breakfast. Then we headed back to the air-conditioned comfort of our room for a mid-afternoon rest. During the afternoon, we went down to hotel reception to get change and washing powder for the guest laundry, and to make a restaurant booking for dinner. On the way there, we walked through the Ochre Gallery of artwork on display in the hotel foyer area. 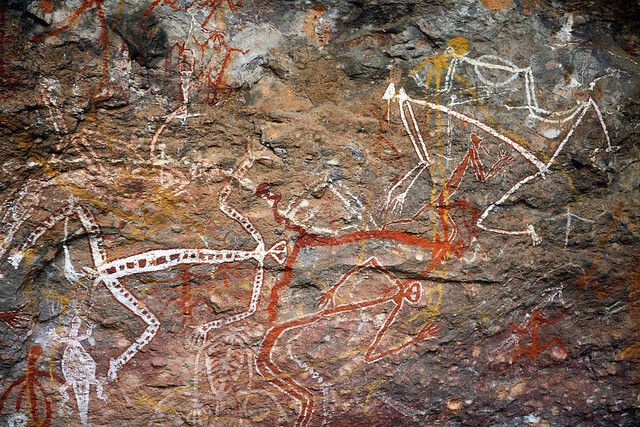 There were numerous paintings done in the distinctive local style, similar to the Nourlangie rock art, with outlined figures filled with cross-hatching in the traditional ochre colours. The style of art here is very different from the dot art style of further south, which was basically the only style we saw at Yulara and Alice Springs. They also had some wooden sculptures of jabiru, magpie geese, barramundi, and so on, plus some didgeridoos. It was quite an impressive gallery. We emerged at 17:00 to drive back to Nourlangie Rock, this time turning off to the parking area near the Nawurlandja Lookout. 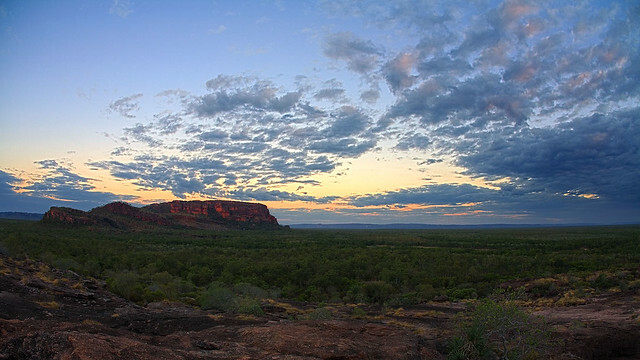 This lookout faces Nourlangie from the west, providing a good vantage point to watch the sunset light on the rock. The day, which had dawned clear, had followed the pattern of yesterday, with increasing cloud leading to a textured grey and white overcast by late afternoon. We feared that the sunset would again be somewhat disappointing, but we had to try. 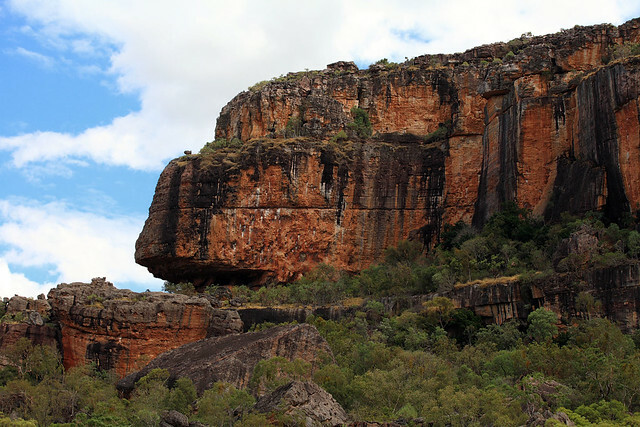 Nawurlandja turned out to be an immense disconnected rock outcrop composed of a crumbly conglomerate with marble-sized rounded pebbles held in a sandstoney matrix, with the strata tilted at about 20°, and forming a fairly flat but sharply sloping table of rock leading up into the sky. The walk up was not too difficult, though it looked quite daunting. The only tricky part was that the surface was very rough and you had to be careful putting weight on each foot to make sure you didn't turn an ankle. At the top of the slope was the lookout, perched on some additional layers of strata that had partly eroded away, leaving irregular and sharp-edged slabs of rock above the main slope. The view from here was incredible and spectacular in all directions. Another couple were there taking photos with a tripod and camera, as well as a film crew made up of a video cameraman, a still photographer, an assistant, and a young woman who turned out to be a host of the Channel 9 children's show The Shak - her name was Jacqui. The tripod couple left soon after we arrived, convinced the sunset would not be worth waiting for. The TV crew lamented the cloud cover also, and the poor light, but stuck it out, constantly cajoling one another about the vagaries of their job and doing various TV things. 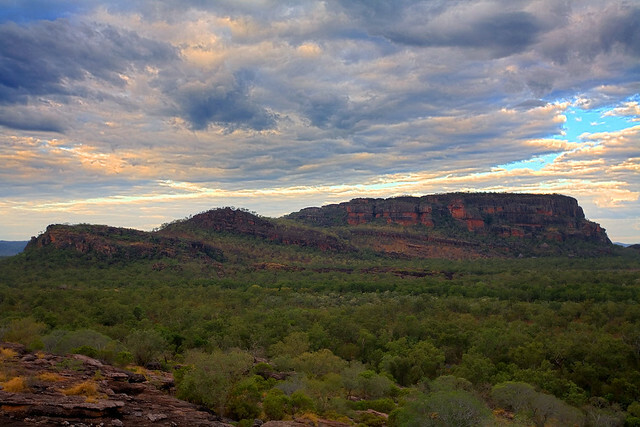 It turned out to be good that we stayed, because the overcast began to break up and soon there were large patches of blue sky above Nourlangie Rock. As the sun crept closer to the horizon, it broke through the cloud in the west as well, bathing the rock in a glorious red light with a dramatic backdrop of pink clouds and fading sky. The Channel 9 photographer went into raptures at the glorious lighting, and we both snapped away. When the show was over and the grey dusk began to settle, we all packed up and retraced our steps down the rocky slope back to the car park. We drove back to Jabiru, reaching our hotel just before 19:30. We'd made dinner reservations at the hotel restaurant for 20:00, but saw if we could get in early. The restaurant offered an à la carte menu, as well as a buffet. Inspecting both, we opted for the buffet, since it had a more varied selection of food. We loaded up on vegetables and I grabbed some penne with crocodile in a white sauce, and some barramundi in a Thai-style lemony mild curry sauce. The fish was delicious, and the crocodile was sort of like a cross between chicken and beef - white meat with pretty much the flavour of chicken, but the texture of beef. Of course being a buffet, I had to take full advantage of the desserts. I decided to have an initial non-chocolate dessert - slices of apple crumble, apple strudel, and a slice made of dried fruits and nuts layered on top of a biscuit base - followed by a second, chocolate dessert. The chocolate dessert consisted of a piece of flourless chocolate-orange-almond cake, a slice of black forest cake, a big scoop of chocolate mouse, and - because I didn't feel like the other options of a plain iced chocolate cake or a vanilla slice with chocolate on top - a piece of carrot cake which I declared to have honorary chocolate status for the purpose of tonight's desserts. It was all good, and given that each individual dessert on the à la carte menu cost $14, I think I got my money's worth from the buffet! After dinner, we retired to our room and watched Andrew Zimmern trying some bizarre foods in Alaska on TV before turning in for the night. During our buffet dinner I had the scathingly brilliant idea of having a specialised dessert buffet - but not merely one where you serve yourself a hodge-podge of different, essentially complete desserts. The idea would be to have all the ingredients for assembling a fancy dessert and to put it together yourself. So you'd grab an oversized plate and put a slice of chocolate brownie in the middle, then stack some mousse on top, a scoop of ice cream on the side, then nuts, a sprinkle of brown sugar, then actually apply a mini blowtorch to caramelise the sugar, shave some chocolate off a big block and arrange it on top, met and spin some sugar out into a ball of golden toffee strands, garnish it with a mint leaf and sliced strawberry, then drizzle raspberry sauce artfully around the plate and finish by dusting the whole thing with icing sugar. Of course you could customise the entire thing using all the ingredients and tools in the buffet, but the aim is to create your own gourmet dessert with an artistic presentation, not merely to cram as many different desserts as you can on one plate. I reckon someone could open a restaurant offering this and it would do great business. Last updated: Wednesday, 23 January, 2019; 12:56:58 PST.